All new case engines are currently at a minimum of eight weeks lead time. 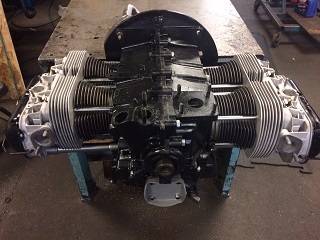 Rebuilt case engines are currently at a minimum of 10-12 weeks lead time. We are a family owned, performance, custom-build shop... and quality takes time. Mofoco is one of the slowest because Mofoco is the one of the best. Buy with confidence directly from the engine builder. Mofoco has almost 50 years of experience in the VW industry building aircooled VW engines. How many other companies allow you to speak with the person building your engine? VW Aircooled 1200cc Premium Longblock with Rebuilt German Single Port Heads. The longblock consists of the basic bottom end of a VW Aircooled motor. It consists of a VW block, piston & cylinders, cylinder heads along with a flywheel and oil pump and everything in between. This is considered the more technical part of the motor and it is tougher to machine and assemble for the at home "Do It Yourself-ers". So we take care of the bottom end and you take care of the top end. You will responsible for swapping your sheetmetal, intake, exhaust, carb, distributor, coil, wires on to this bottom end that we provide you. All of our longblocks are Hot Test Run meaning we actually put our own top end equipment on there so we can run your motor and not just "bench" test it. We do this to ensure the motor is running perfectly before we send it out to you. We adjust the valves numerous times, check the oil pressure, check for any leaks, check compression and do the basic break in for you before you receive. This is how we ensure that the motor is 100% perfect before we send it out and we know that you will have zero problems. On top of that, we even put a 12 month warranty to go with it. Buy with Confidence! We have been building VW Aircooled motors since 1970.